ODPORMAX™ is a food supplement in a form of Flow Caps™ capsules, containing a properly selected composition of ingredients in liquid form: high quality shark liver oil and vitamins A, E, D, and also in a form of innovative pellets: zinc in a form of highly absorbable amino acid chelate Albion® (zinc bisglycinate) and garlic extract standardized to allicin and allin content. High quality shark liver oil is standardized to 20% alkylglycerols and squalene. They are compounds belonging to lipids group, naturally present in a human body, with the highest concentrations in bone marrow and skin. Vitamins A and D, contained in the product, as well as zinc and garlic extract beneficially affect the proper functioning of immune system. In addition, studies on garlic have shown that it can contribute to maintaining bacterial balance of gastrointestinal tract and to defence against harmful microorganisms (bacteria, fungi), and also contributes to proper functioning of heart and circulatory system, helps to maintain proper cholesterol and lipids level in blood. Also, vitamin D helps to maintain healthy bones and teeth, contributes to proper absorption of calcium and phosphorus, and to maintain an appropriate level of calcium in blood, as well as it participates in the process of cell division. Vitamin A plays a role in the process of cells specialization. Vitamin E and zinc help to protect cells against oxidative stress. ODPORMAX™ in the form of liquid capsules, is produced with the use of innovative technology Flow Caps Liquid Technology® which ensures rapid absorption in the body, maintaining high quality of the components, and prevents oxidation of the active substances. roduct intended: for adults and older children, as a food supplement of substances contributing to the natural immune system, especially during decreased immunity (autumn-winter and spring equinox). Recommended use: 2 capsules, with plenty of liquid. Note: Pregnant and breastfeeding women should consult a doctor before using the product. Do not use in case of hypersensitivity to any of the components. 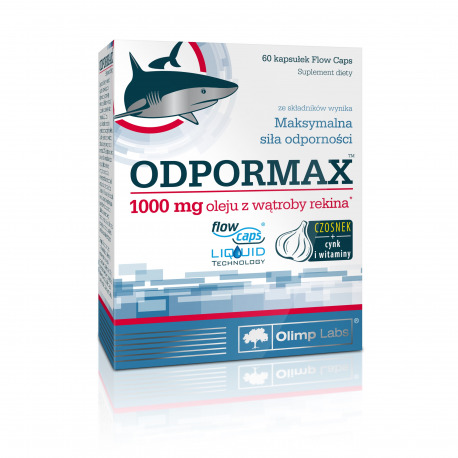 Ingredients: shark liver oil, pellets ingredients - [bulking agent - microcrystalline cellulose, zinc bisglycinate (Albion® zinc amino acid chelate), garlic extract]; DL-alpha-tocopheryl acetate - vitamin E, retinyl palmitate - vitamin A, antioxidant - mixture of tocopherols, cholecalciferol - vitamin D; capsule - gelatin.